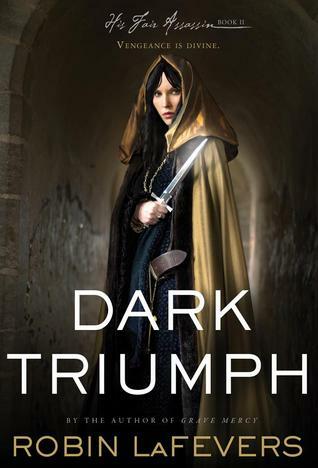 Continues to be best of the best..... presenting His Fair Assassin #2 Dark Triumph by Robin LaFevers. First blood red and bright colors, now Black an God. R.L. LaFevers knows how to change the mood of the story according to the characters and string us along for the read. Dark Triumph, is the second book in the "his Fair Assassin" series. While Grave Mercy was about Ismae, Dark Triumph is about Sybella. While Grave Mercy was a historical event, Dark Triumph is a much more of a personal battle against the homegrown darkness. Battles are dark and ugly affairs, they always have been and always will be. But homegrown evil, the helplessness, the torture, the feeling of not fitting in, of despair is a prospect even darker than an open battlefield. Barricaded evil, the hardest to route out..... and Sybella returns to this evil of her past to conduct her duties as St. Mortain wishes, all the while keeping her faith in her divine father alive..... A tall order to face with no friends to help you for it. In Grave Mercy, Ismae overshadowed everything, our introduction of Sybella then was all for nought, as Dark triumph forces us to re-evaluate everything we knew or felt about her. TrueIsmae and Duval were deeply missed but this was Sybella's turn in the tale and Robin LaFevers administered the worksperfectly leaving no room for mistakes at all. The one thing I felt there would be no happy endings for Sybella. LaFevers paints her story with such darkness, such melancholy and despair. A life of hopeless torture, Sybella had no happiness in her life. Not even with her half-brother who was a bit too close for comfort. Sent to the place of past horrors with the promise of the Mortain's will, Sybella finds that Ismae may have been right, the convent does not always know or misunderstood, the Lord's grace. It was her meeting with Beast that brought her that. Beast who teaches her the meaning of love.... And might I say that the author did wonder molding them together and shaping them like that. An all round winner for me. And with Ismae and Sybella's story done it seems the next one "Mortal heart" is of Annith as she discovers her might...... 2014 looks so distant right now.... so excited for the book. "Dark and Enticing, the much talked about and discussed sequels leaves its own mark, of darkness and sheer hope that he light will guide you to a more better place"
I love the His Fair Assassin books, they are fantastic. I didn't think they could get better after Grave Mercy but Dark Triumph surprised me by surpassing even that. I loved Beast and was also so worried that Sybella wouldn't be able to have a happy ending. I have not read either of these yet! Though I do have them. Looking forward to starting these.